Chemicals giant ICI has said it is to sell its Quest flavours and fragrances unit to Switzerland-based Givaudan in a deal worth £1.2bn ($2.28bn). Proceeds from the sale are expected to be used to reduce ICI's pension deficit and debt, and towards tax costs. Quest's headquarters are in the Netherlands and it employs 3,400 people globally, including sites at Ashford, Kent and Bromborough Port, Wirral. 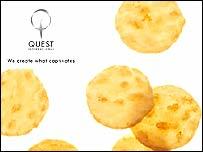 Quest makes flavours for snacks, drinks, dairy products and chewing gum. ICI said the sale would allow it to focus on its coatings and adhesives. "The sale of Quest represents another major step towards realigning ICI," said John McAdam, ICI chief executive. ICI took on Quest as part of an acquisition from Unilever in 1997. It described Quest as a "leading player in an attractive industry". Quest reported sales of £560m in 2005, and Givaudan said the deal would enable it to extend its "leadership position in all strategic segments of the fragrance and flavour industry". It added that the move would also strengthen Givaudan's position and accelerate growth, especially in Asia Pacific, Latin America, Eastern Europe, Africa and the Middle East. The sale remains subject to regulatory approval, but the Swiss firm said it hoped for the deal to be completed in early 2007.